In Anglo-American law the owner of property (especially of land) may and often does grant or devise it to one person for years or for life, and then to other persons forever, or consecutively to several persons for life. The estates or interests thus given to take effect after the first are known as "remainders"; but if the grantor or devisor does not exhaust his entire estate, the interest not disposed of remains in him and his heirs, and this is known as a "reversion." These words are unknown to the Jewish law; but the estates or interests which they designate might arise under it to a limited extent. It has been shown in the article on Alienation and Acquisition that "the owner of land may sell or give it for a term of years [free of rent] or he may sell or give its produce for a number of years"; and the difference between the two forms of grant has also been shown there. There seems to be no objection to a gift for life, though a sale of a life-estate might have been drawn into question, as a chance bargain. Here then is a reversion remaining in the original owner and his heirs. 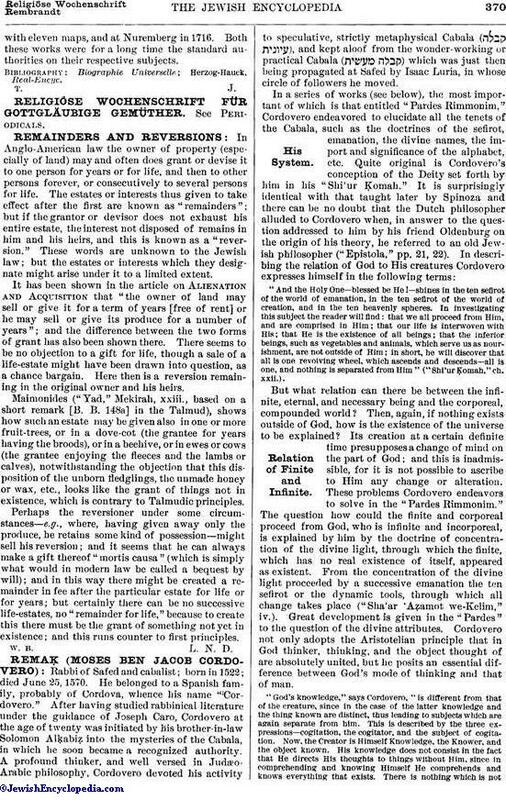 Maimonides ("Yad," Mekirah, xxiii., based on a short remark [B. B. 148a] in the Talmud), shows how such an estate may be given also in one or more fruit-trees, or in a dove-cot (the grantee for years having the broods), or in a beehive, or in ewes or cows (the grantee enjoying the fleeces and the lambs or calves), notwithstanding the objection that this disposition of the unborn fledglings, the unmade honey or wax, etc., looks like the grant of things not in existence, which is contrary to Talmudic principles. Perhaps the reversioner under some circumstances—e.g., where, having given away only the produce, he retains some kind of possession—might sell his reversion; and it seems that he can always make a gift thereof "mortis causa" (which is simply what would in modern law be called a bequest by will); and in this way there might be created a remainder in fee after the particular estate for life or for years; but certainly there can be no successive life-estates, no "remainder for life," because to create this there must be the grant of something not yet in existence; and this runs counter to first principles.